In the summer of 2007, I read an article about thousands of activists in Rome mobilizing against the carriage horse trade. 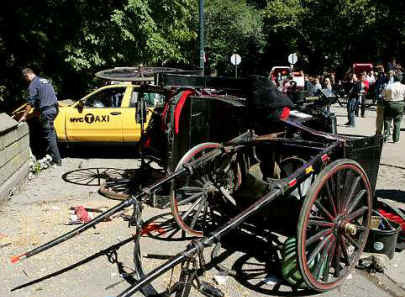 A carriage horse had recently died in traffic, and people took to the streets to convince tourists not to take a ride. Wanting to find out more and to see if their outreach methods could be helpful to our campaign in New York City, I reached out to some activists I knew in Rome. Out of that discussion and many more that followed, Horses Without Carriages International was born -- a global coalition that shares the goal of exposing the injustice and inhumanity in the horse-drawn carriage industry. Our New York-based Coalition to Ban Horse-Drawn Carriages began in January 2006 as a direct response to the death of Spotty, a five-year-old horse who was on the trip back to the stables on a wet and cold night. About halfway there, something startled Spotty. Horses are prey animals, quick to bolt from a perceived danger. In the moment of panic, Spotty ran into the street, throwing his driver to the ground before crashing -- the carriage still attached to his back -- head-on into a station wagon. The grisly image of the horse’s body draped over the car, head on the ground, flashed on screens around the world. The carriage industry in NYC was politically connected and couldn’t be touched, everyone said. While it was hard enough to get regulations for better conditions, the thinking went, it would be impossible to get the industry banned. Still, ending this is the right thing to do. The time has come. As committed grass-roots activists, our challenge is to educate the media, politicians and the public about this tragic and frivolous industry, and through constant exposure on the street, the issue is definitely on the political radar screen. The horse-drawn vehicle industry exists in many cities to cart tourists around (in Baltimore, it’s fruit), amidst buses, cars, taxis, emergency vehicles, motorcycles and trams. The carriages constitute a serious danger to people as well as horses, impeding the flow of traffic and getting in the way of fire trucks and ambulances. Every now and again a horse gets seriously injured or killed. 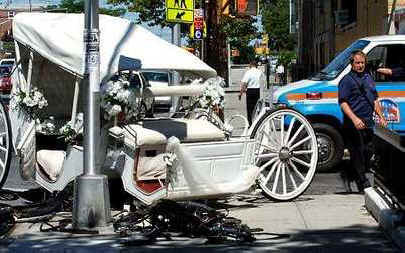 In New York City, at least six people have been hospitalized and three horses have died in horse carriage incidents since 2006. A horse should not be forced to work between the shafts of a carriage with a metal bit in his mouth, a diaper tied to his rear, blinders blocking his view, ear plugs and sometimes a muzzle — all so that tourists can take a 30-minute ride. Borrowing from the phrase on Friends of Animals’ web site, we advocate for the right of horses to live free according to their own terms. 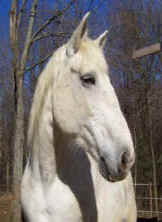 For carriages horses, who are already dependent on us, the closest we can come to this is a respectful sanctuary. The idea of forming a coalition and standing in solidarity with like-minded activists from other cities is finding great public appeal. We all face politically entrenched industries and drivers claiming to love their horses. We can share campaign philosophies and materials. We have become known as a force to be reckoned with -- and to learn from. 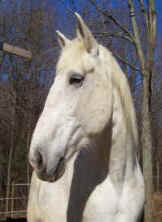 Horses Without Carriages International announced specific days on which advocates stand in solidarity with each other. Activists offer vigils and protests, information tables and petitions. December 6, 2007 was the first day of protest, at the peak of the annual holiday shopping season. Our most recent global day, the 6 th of June, was chosen because it is at the beginning of the hot summer tourist season. Other vigils and performances in streets happen according to when various groups of activists plan them. In addition to the group in New York City, members of the coalition include organizations in Philadelphia, Boston, Atlanta, Chicago, Dallas, Fort Worth and St. Augustine, along with Victoria, Montreal, Dublin, Rome, Florence, Vienna, Innsbruck, Salzburg, Belgrade and Tel Aviv. The latter two cities are trying to end the practice of using cart horses. Our website lists the participating cities. Click them to see photos of the events. Our next international day will be in December 5, 2009. The Coalition to Ban Horse-Drawn Carriages works with Friends of Animals in New York City, and FoA also has an active campaign in Philadelphia and Victoria, British Columbia. If you would like to be part of this coalition, please e-mail us.